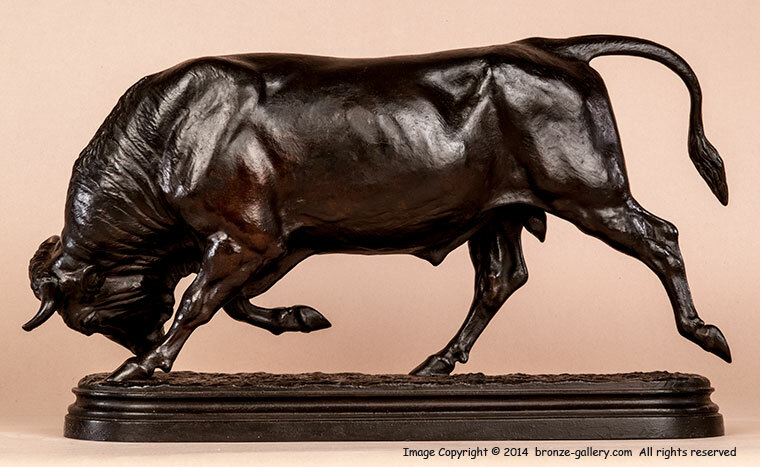 Isidore Bonheur was one of the best of the Animalier sculptors and excelled at portraying horses and cattle. His Le Grand Jockey is one of the finest sculptures ever done of a Race Horse with his Jockey, and his Bulls and Cows are also superb. Many of his models of Bulls were made into agricultural awards and were treasured by their recipients. 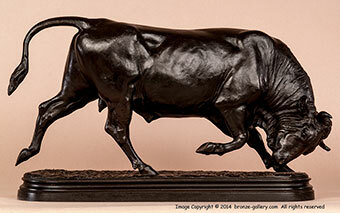 This fine large bronze shows a powerful Bull in full stride with his head down. Bonheur has captured the nature of this strong and muscular Bull as he charges. A fine model not often offered for sale, this is one of Isidore Bonheur’s best sculptures. The bronze has an oval base and is finished with a dark brown patina.